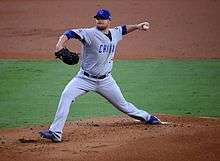 Jonathan Tyler "Jon" Lester (born January 7, 1984) is an American professional baseball pitcher for the Chicago Cubs of Major League Baseball (MLB). He previously played in MLB for the Boston Red Sox from 2006 to 2014 and the Oakland Athletics in 2014. Less than two years after being diagnosed with lymphoma, Lester started and won the final game of the 2007 World Series for the Red Sox, and in May 2008, pitched a no-hitter against the Kansas City Royals. He won the 2016 World Series with the Chicago Cubs. With a rash of injuries and general ineffectiveness of several Red Sox starters, the team recalled Lester on June 10 to make his major league debut against the Texas Rangers. He put up a 7-2 record and a 4.76 ERA in 81 1⁄3 innings pitched in his rookie year. Lester made his first 2007 start for the Boston Red Sox on July 23 against the Cleveland Indians at Jacobs Field in Cleveland, pitching 6 innings, allowing 2 runs on 5 hits and struck out 6, picking up the win. In the 2007 World Series against the Colorado Rockies, Lester won the series-clinching Game Four for the Red Sox, pitching 5⅔ shutout innings, giving up three hits and three walks while collecting three strikeouts. Lester became the third pitcher in World Series history to win a series clinching game in his first post-season start. On March 8, Lester agreed to a five-year , $30 million contract extension with a $14 million team option in 2014. The season started poorly, with him allowing 11 runs and getting losses in his first two starts This was the first time he lost in consecutive regular season starts. He began to pitch very well in late May, going 12-3 with a 2.31 ERA in his final 22 starts. 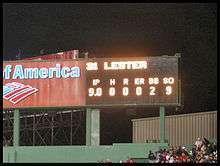 On June 6, Lester made his bid for a second no-hitter against the AL West-leading Texas Rangers at Fenway. He pitched 6 1⁄3 perfect innings, striking out 10 batters, on 61 pitches through the first six innings. Michael Young hit a one-out double to left center field in the seventh inning to break up the no-hitter, but Lester pitched a complete game, striking out a total of 11 batters, giving him 23 Ks in two starts (he had a career-best 12 Ks his previous start). On August 14, Lester struck out ten batters for the sixth time in the 2009 season, the most times ever by a Red Sox left-handed pitcher. He had never done it before that season. Lester started 32 games in 2009, going 15-8 with a 3.41 ERA. On July 25 he took a perfect game into the sixth inning against the Seattle Mariners but lost it in that inning due to an error made by Eric Patterson. A home run by Michael Saunders broke up the no hit bid. The Red Sox eventually lost the game. The loss was the second of four losses in a row Lester took after the All-Star break. He would eventually turn it around throwing 6 shutout innings against the Yankees and then 8 shutout innings, despite feeling sick, against the Rangers. Lester finished the season strong but fell just short of 20 wins. In 2012, Lester was again the opening day starter for the Red Sox. Lester's season was very disappointing, posting a 9-14 record, a sub-par 4.82 ERA, and a .273 batting average against. On May 10, 2013, Lester threw a complete game one-hitter, with 0 walks, against the Toronto Blue Jays, facing only 28 batters. Cy Young still remains as the last pitcher to throw a perfect game with the Red Sox, back in 1904. On October 3, 2013, Lester was named as the starting pitcher for the 2013 ALDS against the Tampa Bay Rays in the Red Sox first return to the postseason since 2009. The following day, Game 1 of the ALDS took place at Fenway Park with Lester pitching 7 2⁄3 innings with three walks and striking out seven and the Red Sox winning 12-2 (and winning the series 3-1). Lester also tied Josh Beckett's Red Sox Postseason record of 4K's of the first four batters to begin the game. Lester started Game 1 of the 2013 ALCS against the Detroit Tigers on October 12, 2013. He pitched 6 1⁄3 innings with four strikeouts and allowed one run, but was outmatched by a one-hit game put together by the Tigers' pitching staff led by starter Anibal Sanchez. At Comerica Park on October 17, 2013, Lester again faced Sanchez in Game 5. The Red Sox won 4-3 with Lester pitching 5 innings and showing spectacular defensive skills in the 5th inning throwing out former teammate Jose Iglesias with a glove flip to first base on a bunt attempt. After the Red Sox victory in the ALCS, Lester was selected to start Game 1 of the 2013 World Series against the St. Louis Cardinals. Lester pitched to an 8 to 1 victory over St. Louis starter Adam Wainwright. Lester then went on to a Game 5 win again over Wainwright giving the Red Sox a series lead of 3-2. The Red Sox won the series in six games. On July 31, 2014, Lester and Jonny Gomes were traded to the Oakland Athletics for Yoenis Cespedes and a competitive round 2015 draft pick. The move reunited Lester with former teammates Jed Lowrie, Coco Crisp, Brandon Moss and Josh Reddick. He won his debut start against the Kansas City Royals on August 2. He had a 6-4 record and a 2.35 ERA, while pitching for the A's. Lester had a 16-11 record with a 2.46 ERA and finished 4th in the AL Cy Young voting. On Oct. 9, 2015 he was the losing pitcher in Game One of the NLDS vs. the Cardinals. On Oct. 17, 2015 he took another loss in Game One of the NLCS vs. the New York Mets. In 2016, Lester finished second in the NL with 19 wins, matching his career high. He was also second in ERA (2.44). Teammate Kyle Hendricks was the league leader at 2.13. Lester also started Game 1 of the 2016 National League Championship Series against the Los Angeles Dodgers, he pitched six innings and allowed just one run and had a no-decision. He also started Game 5 of the series and pitched 7 innings of one run ball, earning his third win of the postseason. The Cubs would go on and win the series 4 games to 2. Lester was named Co-MVP of the 2016 NLCS along with Javier Báez. Lester's performance helped propel the Cubs to the World Series for the first time since 1945. Lester was named the Game 1 starter of the 2016 World Series against the Cleveland Indians, where he took the loss after throwing 5.2 innings and allowing 3 runs. Lester also started Game 5, allowing just 2 runs in 6 innings, leading to a 3-2 Cubs victory to extend the series. Lester pitched in relief in game 7, which the Cubs won to win their first championship in 108 years. Lester grew up in Puyallup, Washington and attended All Saints School. He later attended Bellarmine Preparatory School where he was a three-time MVP and three-time All-Area selection. On January 9, 2009, Lester married Farrah Stone Johnson, whom he met in 2007, while making rehab starts in single-A Greenville. They have two sons together. In March 2011, Lester partnered with Charity Wines to release his own wine label under the Longball Cellars brand. Proceeds from sales of his CabernAce cabernet support the Hutchinson Cancer Research Center, the place where Lester himself was treated, to aid the development of targeted immunotherapies. Funds raised from this initiative will help researchers maximize the body’s own ability to strike out and eliminate disease so lymphoma patients can extend their life. He is partnering with former teammate Clay Buchholz who is also releasing a Charity Wine, called ChardonClay, to raise money for the Jimmy Fund. ↑ "Jon Lester — Bio". jockbio.com. Retrieved December 11, 2014. ↑ Edes, Gordon (November 22, 2005). "This Marlin a pretty big fish for Sox to land". Retrieved October 20, 2011. ↑ Archived September 1, 2006, at the Wayback Machine. ↑ ESPN (December 5, 2006). "Report: Lester's latest CT scan clean". ESPN.com. Archived from the original on July 10, 2007. Retrieved December 5, 2006. ↑ "Sox: Lester has treatable form of lymphoma.". Boston Herald. Associated Press. September 1, 2006. Retrieved September 1, 2006. ↑ "Red Sox option LHP Jon Lester to Pawtucket". MLB.com. June 11, 2007. ↑ Wilbur, Eric (November 28, 2007). "Lester gets the honor". The Boston Globe. ↑ Ian Browne (May 19, 2008). "Lester hurls 18th Red Sox no-no". Retrieved May 19, 2008. ↑ Sean McAdam (May 20, 2008). "Lester traveled hard road to no-hitter". ↑ Maureen Mullen (May 20, 2008). "No-hitter not possible without Ellsbury". ↑ Chuck, Bill. 100 random things about the Red Sox, Rays, and Yankees, The Boston Globe. Published April 2, 2009. Retrieved May 2, 2009. ↑ Chuck, Bill (April 2, 2009). "100 random things about the Red Sox, Rays, and Yankees". Retrieved October 20, 2011. ↑ "Jon Lester 2008 Pitching Gamelogs — Baseball-Reference.com". Sports Reference LLC. Retrieved October 20, 2008. ↑ Real Insight. Real Fans. Real Conversations. Sporting News. Retrieved on November 15, 2011. ↑ "Jon Lester 2009 Pitching Gamelogs — Baseball-Reference.com". Sports Reference LLC. Retrieved March 8, 2015. ↑ "Jon Lester Postseason Pitching Gamelog — Baseball-Reference.com". Sports Reference LLC. Retrieved March 8, 2015. ↑ Brown, Ian (October 17, 2011). "Lester: We did drink in clubhouse during games". Retrieved October 20, 2011. ↑ "Jon Lester Makes the All-Star Team". ↑ "A's acquire Jon Lester, send Cespedes to Boston". Retrieved July 31, 2014. ↑ Lee, Jane. "New guys shine, bats come alive in Lester's debut". MLB.com. Retrieved August 3, 2014. ↑ "Free agent Lester agrees to deal with Cubs". Chicago Cubs. Retrieved January 20, 2015. 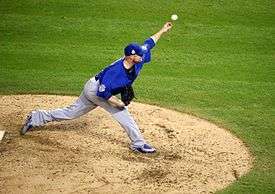 ↑ "Jon Lester to sign with Chicago Cubs - ESPN Chicago". ESPN.com. Retrieved January 20, 2015. ↑ Cohen, Jay. "Lester's Cubs debut doesn't go well.". bostonglobe.com. Boston Globe. Retrieved 7 April 2015. ↑ "Sortable player stats/Pitching". chicago.cubs.mlb.com/stats/sortable. Major League Baseball. Retrieved 1 May 2015. ↑ Snyder, Matt (May 27, 2015). "Jon Lester sets dubious record by starting career 0-for-58". CBS Sports. Retrieved May 27, 2015. ↑ "Jon Lester". Forbes. 2015. Retrieved April 28, 2016. ↑ "Birth of son inspires Jon Lester", MLBPlayers.com, June 11, 2012. ↑ "Jon and Farrah Lester". fabwags.com. September 10, 2013. ↑ "Jon Lester Off The Marriage Market". wbztv.com. July 11, 2008. Archived from the original on May 6, 2009. ↑ Jon Lester and Clay Buchholz to Release Charity Wines this Spring. Charityhop.com (May 5, 2011). Retrieved on 2011-11-15. ↑ "Red Sox' Lester Launches 'NVRQT' To Fight Children's Cancer". CBSBoston. Retrieved July 18, 2013. ↑ "What is NVRQT?". NVRQT.org. Archived from the original on June 16, 2013. Retrieved July 18, 2013. ↑ Lester, Jon. "Guest column: Sox' Lester will NVRQT in fight against pediatric cancer". Boston.com. Retrieved July 18, 2013. ↑ Lester, Jon. "MLB pitcher battles cancer, never quits". CNN. Retrieved July 18, 2013. ↑ Sullivan, Paul (6 October 2016). "Jon Lester's moment to make history with the Cubs has arrived". Chicago Tribune. Retrieved 2 November 2016.